The first visit to the eye doctor can be a little overwhelming for young patients. No matter how welcoming the staff, small children may feel shy or find vision testing machines and gadgets a little intimidating. Luckily, parents can make visits much less daunting by following a few of these suggestions. Whether you're 3 or 33, new situations are a lot less scary if you know what to expect. Before your child's visit, explain the purpose of the visit. (You want to make sure he or she can see well.) Use age-appropriate language to explain the various steps in the eye examination process, which usually include a brief review of your child's medical and vision history, a physical examination of the eyes and eyelids, and a visual assessment to determine if your child can see clearly. During the assessment, your son or daughter will be asked to look at images or letters. Preschoolers may view several large capital Es that face in different directions. They'll use their hands to indicate which direction the arms of the Es point. If your child knows the letters of the alphabet, he or she will read the traditional Snellen eye chart. Eye drops may be used to dilate your child's pupils. Dilation helps the optometrist view the retina, a light-sensing layer of cells that line the back of the eye. Although the drops aren't painful, they will make your son or daughter's vision a little blurry. Be sure to mention that the eye doctor will also look in your child's eyes with a small light during the examination. Kids, like all of us, tend to feel a little more energetic at certain times of the day. If you want to make the visit as pleasant as possible, choose a time when your son or daughter is usually happy and well-rested. Scheduling visits during your child's usual meal or nap time, immediately after a nap, or at the end of a long day can result in a cranky child who is reluctant to participate in the vision assessment. Appointments usually last an hour or less, but may take longer if your child's eyes are dilated, several of your children will receive examinations, or you want to select eyeglass frames for your son or daughter at the end of the visit. If you plan to schedule a group visit, it may make sense to bring the other parent or another adult with you to help supervise your children. The eye doctor will make every effort to see your child at the appointed time, but that doesn't mean you won't spend a little time in the waiting room completing paperwork. Prepare for the short wait by bringing a few toys or books from home to keep your little ones occupied. Some kids hop on the exam chair without prompting, while others aren't quite as brave. If your young child is nervous or anxious, feel free to hold him or her in your lap during the assessment and examination. Older children may feel more confident if you stay by their sides or sit in a nearby chair during the visit with the optometrist. Feel free to ask questions and share your concerns with the optometrist. As parents are often the first people to notice changes that may be signs of vision problems, your input is encouraged. Is it time for your child's first eye examination? 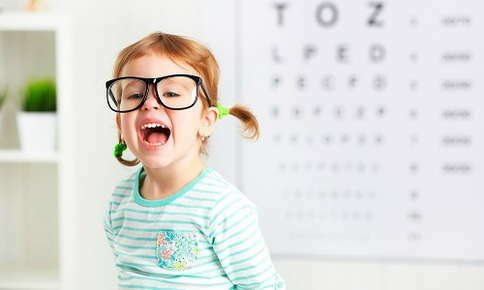 The American Optometric Association recommends that children visit the optometrist for the first time at 6 months old, followed by another visit at age three, then bi-yearly visits from 6 to 18. Contact us to schedule a convenient appointment for your son or daughter. Anthony N. Sacco, O.D., P.C.